The 2018/19 Premier League title race: postpone "fraud"
Home https://server7.kproxy.com/servlet/redirect.srv/sruj/smyrwpoii/p2/ Sport https://server7.kproxy.com/servlet/redirect.srv/sruj/smyrwpoii/p2/ The 2018/19 Premier League title race: postpone "fraud"
When Liverpool's official account tweeted the starting XI selected by Jurgen Klopp on Monday night, it provoked a wave of violent responses from those claiming to be supporters of the club. The main issue for their contempt was Adam Lallana, an English international chosen to play in midfield due to injuries suffered by Georginio Wijnaldum and Jordan Henderson. & # 39; Now for the right team & # 39; was the typical answer. One included a poison of a cartoon suicide, another of someone pulling a nose over his neck. At least some were happy, though hardly in a supportive way: they welcomed that Wijnaldum and Henderson had little banks because they did not like to see them in their teams. -1, Lallana was no longer the story. Suddenly, social media supporters expressed concern that their team was "losing the title". Search Twitter for & # 39; Knock sacked & # 39; If you think it's the worst of the extreme reaction. Yes, Klopp would be fired if Liverpool didn't win the league. For what it is worth, Liverpool is on the pitch to achieve the third highest point in Premier League history and the highest points in the club throughout history. If social media is not a barometer of the majority opinion or the natural environment of a reasoned debate, some are still striking among some. Where did we all go wrong? Liverpool is just this week's example of the sad hysteria that now encompasses football coverage. Last week, you could listen to pundits who say Maurizio Sarri is facing the immediate bag at Chelsea. When Manchester City lost Newcastle, the Bald Fraud Army mobilized their troops. Over the course of six weeks, Mauricio Pochettino has been cursed by Tottenham for losing to Wolves, praising their three-game winning response, again throwing for the cup defeat and then praising late victories. Tottenham's participation in the title race follows the same path as a hokey-cokey dance. Things are happening in football matches. Hold drop points. Football players are human and are therefore unattainable. We have not yet created a club filled with football machine. We give liberal grandeur and ignominy, and very few deserve either description. What's worse, we redistribute these terms more often than the wind changes. It has created a bizarre world, where reputation is exclusively determined by an extreme prism. 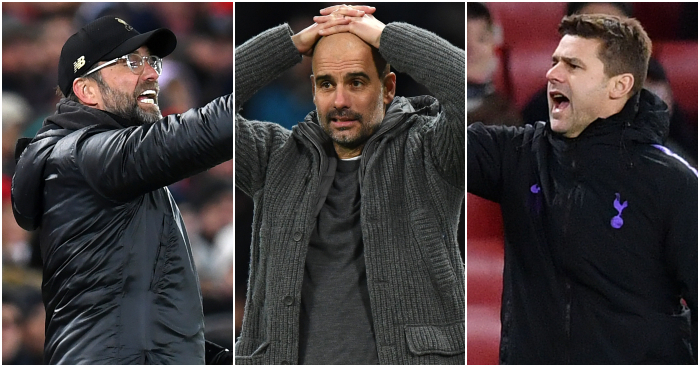 If Liverpool finish second, Tottenham third and Manchester United fourth, hardly a very unlikely scenario, there will be four top six teams (Liverpool, Spurs, Arsenal and Chelsea) whose current leaders are accused of monitoring disappointment this season. And disappointment means fraud. It's exhausting. The financial inequality and competitive imbalance of the Premier League is partly responsible for the increased resistance of opponents. The gap between the top six and the others – incidentally, economically – has never been wider. As such, victories against "resting" have been expected rather than ambition, and any fallen points are a relative crisis. Take Tottenham as an example of the reduced margin of error. Pochettino teams are heading to reach 87 points, which is likely to see Tottenham join third and their leaders' progress seriously questioned. The total number of points would have won the Premier League in 1996, 1997, 1998, 1999, 2001, 2002, 2003, 2010, 2011, 2014, 2015 and 2016. The objectives have been moved. A victory at something other than a convincing scoreline thus fails to deposit anything into a manager's bank of goodwill. Defeat and pulls give significant withdrawals. Only any triumph counts as success, and any stumbling block is evident in the inability to withstand the struggle. If the media only plays a small role on the production line in the supporter's opinion, it is an important gear in its distribution. In the wild west of digital journalism, selling pieces and never again having to do so has never been more difficult. Psychologists have repeatedly proven negativity disorders where a sudden crisis is more interesting to readers than a sustainable improvement. No one wants to read that everything is fine and nothing sells like bad news. Call someone a fraud and people click to enjoy them being called fraud and get angry that they are called fraud. Easy. This tendency for crisis reporting has been exacerbated by the glamor of extreme opinion, a phenomenon that applies to much more important subjects than football. & # 39; Twitter responds & # 39; has become an unworthy but common headline, media plumping for sensational negative seller and then raising their hands to say "Not me, guv." & # 39; Liverpool players accused of having dropped Premier League title races by angry fans after losing points against West Ham & # 39; was a Tuesday offer that adhered to the original Liverpool example. Social media has made it possible for socially social to become social. Someone who would normally have had a monstrous opinion rejected, can now find like-minded (and often anonymous) people who share it. When these statements are rendered inappropriate (as in this BBC example), they inevitably disseminate. The Premier League and media have delivered the Petri dish, but the nature of the football support itself seems to have changed. Tribalism continues to grow to the extent that many praise an opposition club as their own blasphemy, and these people's anger is extraordinary. Journalists and writers joke about it (and I take my little violin out here), but horrible personal abuse is received for accused pretension against all top six teams. Crucially, this extremism becomes self-fulfilling. Self-centering races isolation, isolation rages more anger and anger raises further self-centering. I clearly remember Sheffield Wednesday supporters applauding Nottingham Forest's goals in a 7-1 victory in Hillsborough in 1995, and sections of Forest's support do the same during a 5-1 defeat to Blackburn Rovers the following season. It's hard to imagine that happening now as football has become an increasingly serious business. Fans have been defined not by their love for the game or the support of their team, but their angry defense of their own narrow views on both. In November, Kick It Out reported an increase in discriminatory abuse of 11% from 2016/17 to 2017/18, with reports of 22% racism. Last week, Sport Minister Mims Davies announced an urgent meeting with football leaders to address the issue of increasing discrimination. As anger is markedly rising, it is difficult not to establish a link between the growth of the football strain and the growth of unacceptable abuse. Even away from the worst elements of followers, there exists a general craze that is enough to give you migraines. The melodrama and hysteria now come as standard as clubs and leaders throw between crisis and glory as a railroads and followers delight in both according to their loyalty. No longer is it enough to wait until the end of the season for medals and decorations to be handed over. Why bother when you can scream and scream and scream until you're sick after every fight. And you can. Over the next 15 weeks, one of the best titles this year will play out. We have masters Manchester City whose financial advantage puts pressure on those who defend their crown. We have Liverpool under the magnificent Klopp, who has lost the entire season and will return to the top of the table once more if they beat Bournemouth at home, despite the bedwetting of some supporters. We have Tottenham, sticking over their economic weight and five points from the top, an undoubtedly emotional story. Twenty years ago, supporters of the three clubs would have hoped and prayed and prayed and hoped. If they had been short, the journey would have been appreciated and admired. The rest of us would have put back and enjoyed the show. Everything felt positive, still a soap opera, but one that meant nothing as well as everything. Is the same true in 2019, or has & # 39; nothing & # 39; been lost? Was Everton & # 39; Bottlers & # 39; in 1986 to let a wonderful Liverpool creep past them? Was Alex Ferguson a "fraud" because Manchester United couldn't beat West Ham on the last day of 1995? Was Arsenal shocked because they lost to Leeds in May 1999? Or do we commute the losers, but remember the winners? This could be the first Premier League title race that will be defined by those who miss instead of those who win, and people are itching to pour passion for those who miss. Be victorious, and you must rise like a knight.